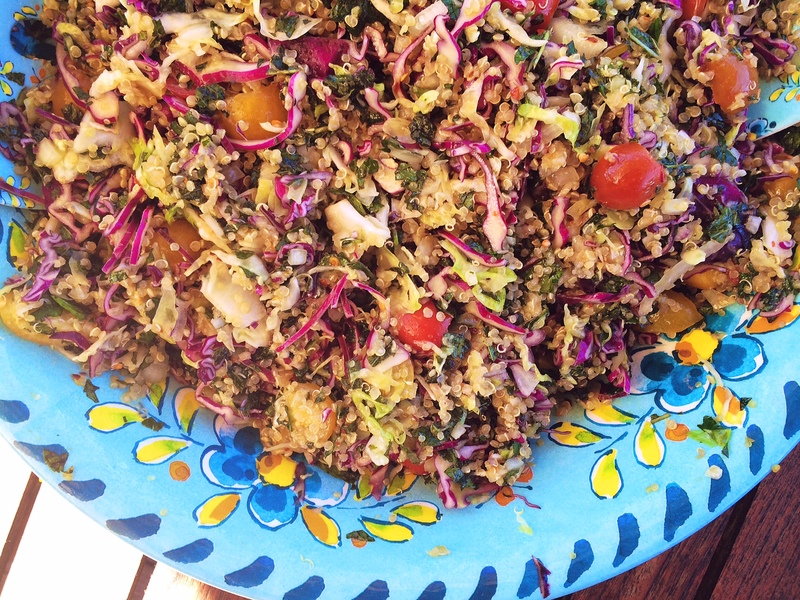 When I wasn’t making loaf after loaf of my new go-to zucchini bread, we were eating this salad. On a hot summer day, the last thing I wanted to do was make zucchini lasagna or stir frys…and this zoodle salad is so adaptable it solved all of our problems. Here we have the basic version with a homemade, herby buttermilk ranch, but we ate this salad many times with store bought dressing (don’t tell anyone) and it was still amazing. Add different toppings, throw on some grilled chicken, just about anything works! I found the secret to this salad was chilling the zoodles for at least an hour. It made them extra crunchy and took out some of the moisture so you didn’t have a soggy zoodle salad. 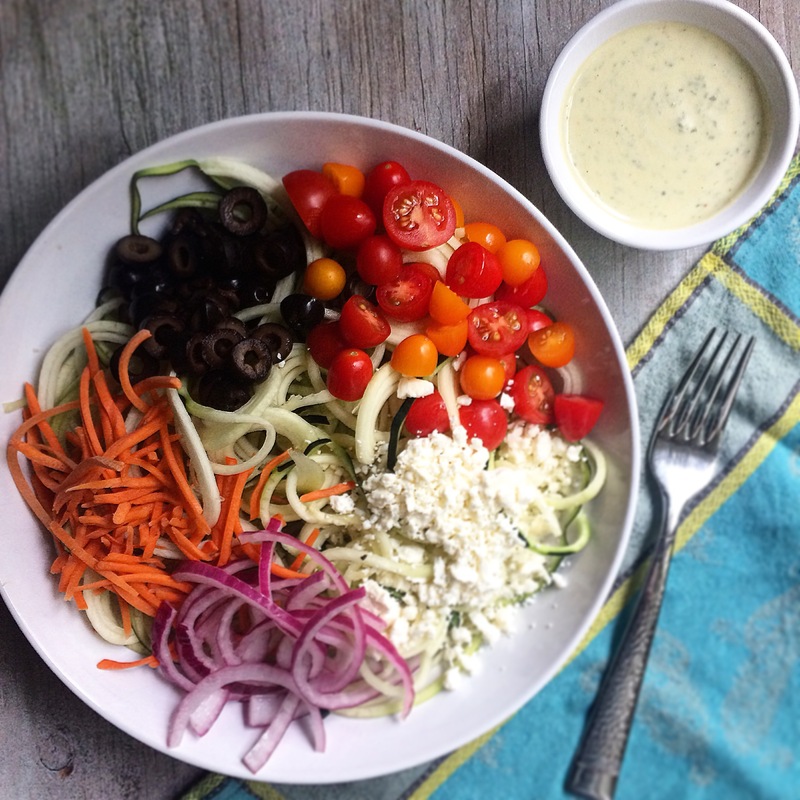 Move over, lettuce…zoodles make summer salads more fun. 2 tsbp siracha (if you want to add some spice)! Using a spiralizer (I have the Paderno Spiralizer), make your zucchini noodles: I use the small spaghetti-sized blade for this salad, but the thicker noodle blade works great too! Lightly blot dry your zoodles with paper towels and place them in an airtight container, and refrigerate for at least an hour. I find refrigerating the zoodles takes some of the moisture out and ends up giving your salad a nice crisp crunch. You do not want a soggy salad! You can make your zoodles the night before and store in the fridge until you are ready to use them. Place all ingredients into a food processor and blend until smooth. Transfer the dressing to a container, cover, and refrigerate for at least an hour to let the flavors develop. Place the red onion in a small bowl and add the tablespoon of white wine vinegar. Add a little bit of salt and pepper and let stand while you assemble the rest of the salad. Divide the zoodles in half and place on 2 bowls or plates. Add half of your toppings to each bowl; the carrots, olives, tomatoes, feta, and onions. Serve with the herby buttermilk ranch and enjoy! One of the things in life that I really excel at, seriously, I don’t even have to try – is making healthy things not so healthy anymore. But I am also dangerously good at convincing people (mostly myself) that the un-healthified meal in question is basically like eating plain lettuce. The real moral of the story here is that for this ridiculous dialog to be happening, there has to be a sliver of healthy goodness in there. I don’t scream out, “HEY, IT’S VEGGIE!” when I’m shoving my face at Burgerville eating my favorite Spicy Anasazi Bean Burger. I usually know when to shut up and just enjoy it. But at least I don’t get the double bacon cheeseburger…. 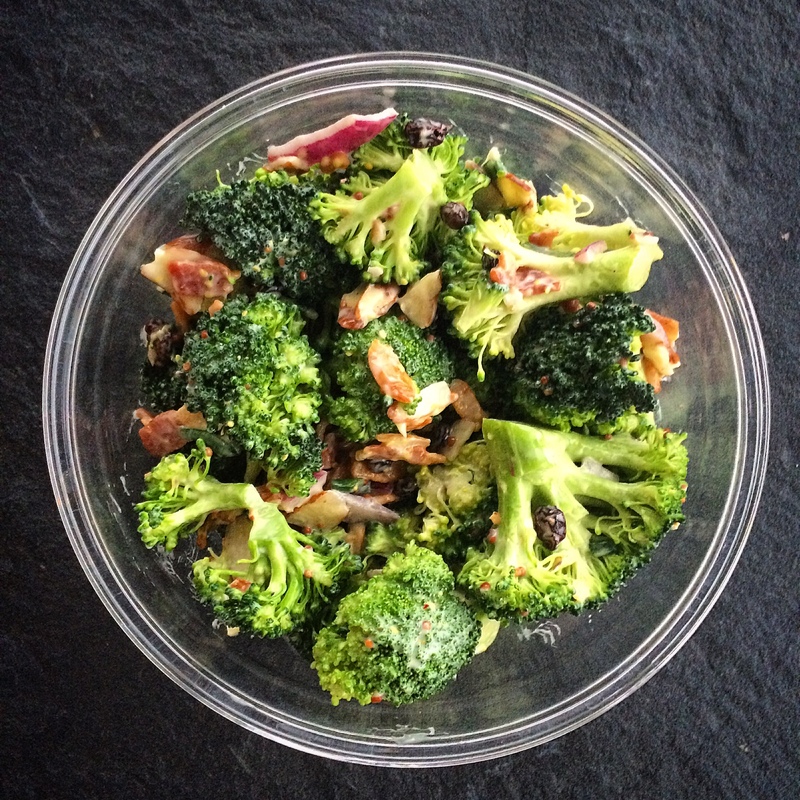 So anyways, this broccoli salad, yeah. It’s pretty good. 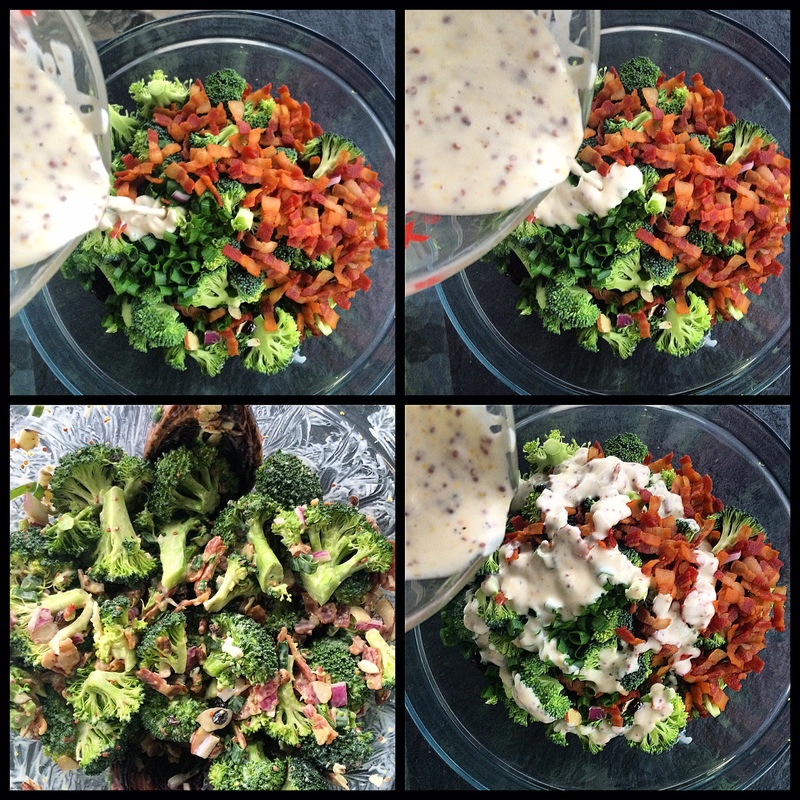 No, we aren’t eating plain broccoli here, we are throwing on some creamy dressing and bacon. But broccoli is going to steal the show no matter how much we try to trash this up. This is a riff on those broccoli salads you have at Bridal Showers, Summer BBQ’s, and the stuff you pick up for lunch from the deli counter. Since first making this, it’s been requested by Jordan for his work lunches several times. 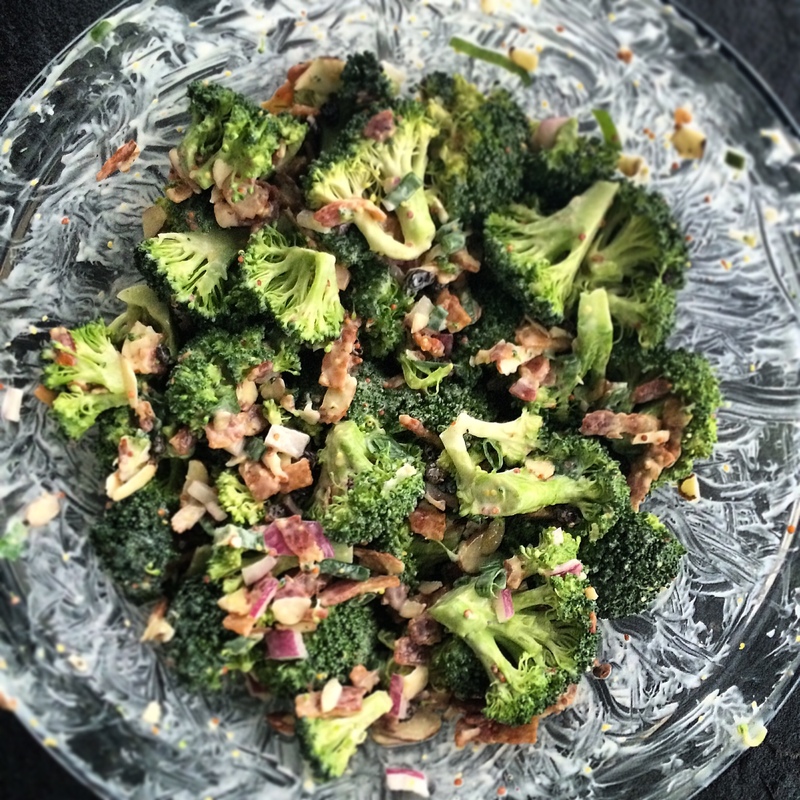 However, if you are bringing it to work, you may want to leave out the garlic in the dressing and those red onions out of the salad…Broccoli + garlic + onions can be pretty potent, if you know what I mean. Your call though, it’s really tasty either way! 1. Place all dressing ingredients into a small mixing bowl and whisk together. Base amounts on how thin you like your dressing. If you like a thicker dressing, add 1 1/2 tablespoons apple cider vinegar. Like it thinner? Add about 2 tablespoons. If you want a sweeter dressing, add more honey, if you need a little zing, add some lemon juice! We eyeball ours and it comes out a little different each time, but it’s always delicious. 2. 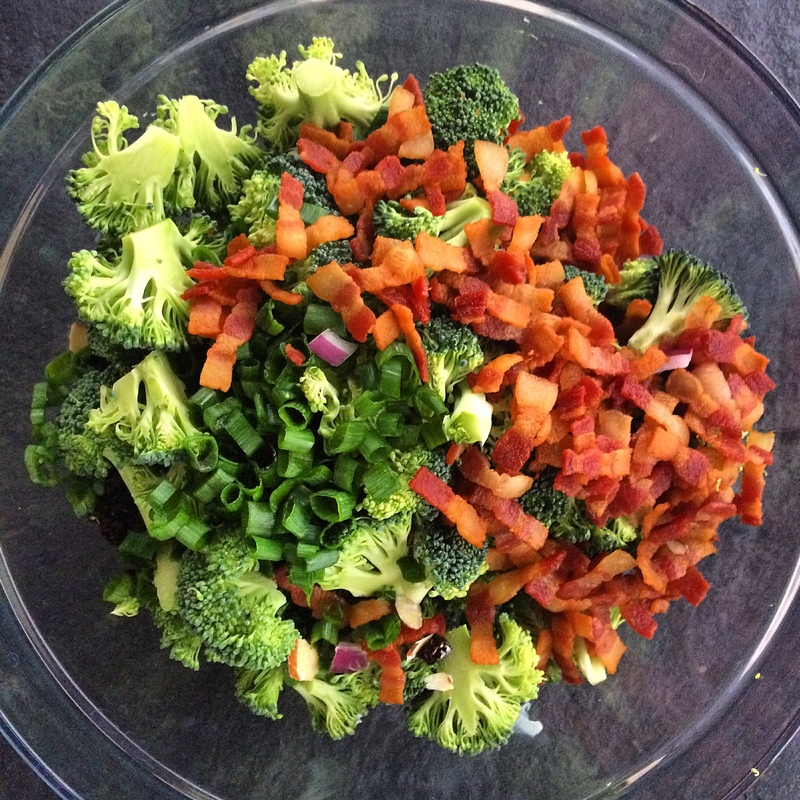 Place broccoli florets and all other salad ingredients into a large mixing bowl and top with dressing. Fold together until fully combined. 3. Adjust seasonings if necessary. Cover with plastic wrap and refrigerate for at least 4 hours and up to 1 day. 4. Toss salad before serving. This salad is great to make ahead and save for work lunches, but it’s always a hit at parties too! Have you ever found yourself with an abundance of an herb, and you don’t quite know what to do with all of it? Have you ever decided to plant something, thinking you would probably kill it, when all of a sudden you have too much of one thing? I feel like this has happened to a lot of home gardeners with mint. You imagine you are going to have some mojitos, maybe throw it in some tea, and that’ll be it. However…many times you are left with so much mint you just don’t know how you will EVER use it all. This Tabbouleh salad is a great solution to your mint problem. Here we use 3 cups (!!!) mint to make a refreshing and healthy summer salad. Of course, if you don’t quite have that much mint in your garden you can easily use only 1-2 cups and you are still going to have a GREAT tabbouleh. The quinoa and cabbage really mix things up too. *NOTE: you can use only green or only purple cabbage – just make sure you have about 4 cups chopped cabbage total. Place rinsed, dried quinoa in a pot and add 2 cups water. Bring quinoa to a boil, then let simmer, covered, on the stove until quinoa has absorbed most of the water. Fluff quinoa with a fork and remove from heat. 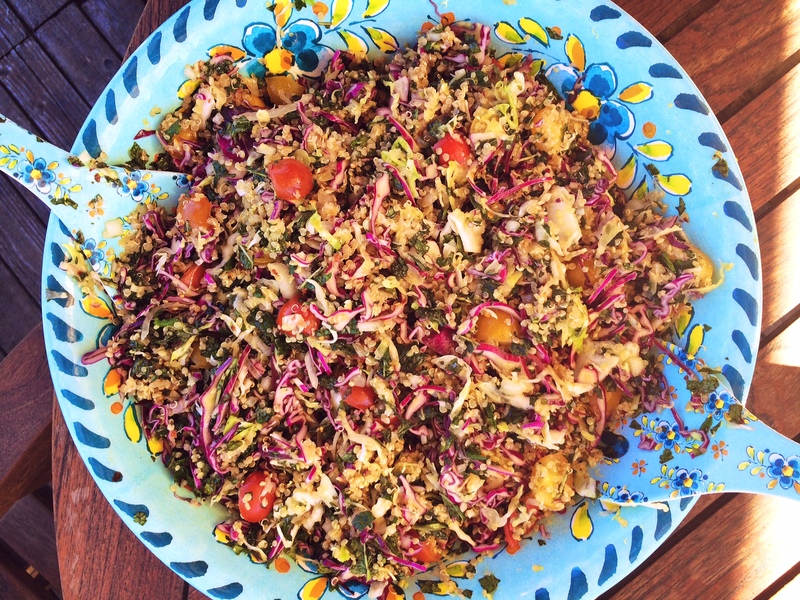 Toss quinoa, cabbage, onion, tomatoes, mint, oil, lemon juice, and red pepper flakes in a large bowl to combine; season with salt. DO AHEAD: Tabbouleh can be made 4 hours ahead. You can toss with oil and lemon juice just before serving, but I like adding it right away and letting the flavors develop. 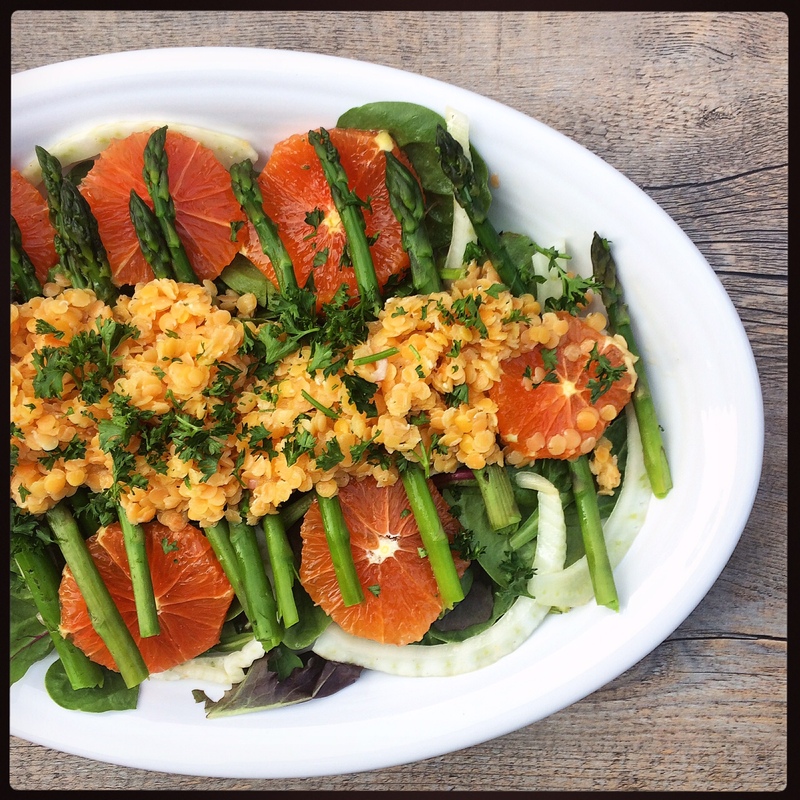 This salad is great the next day, straight out of the fridge! 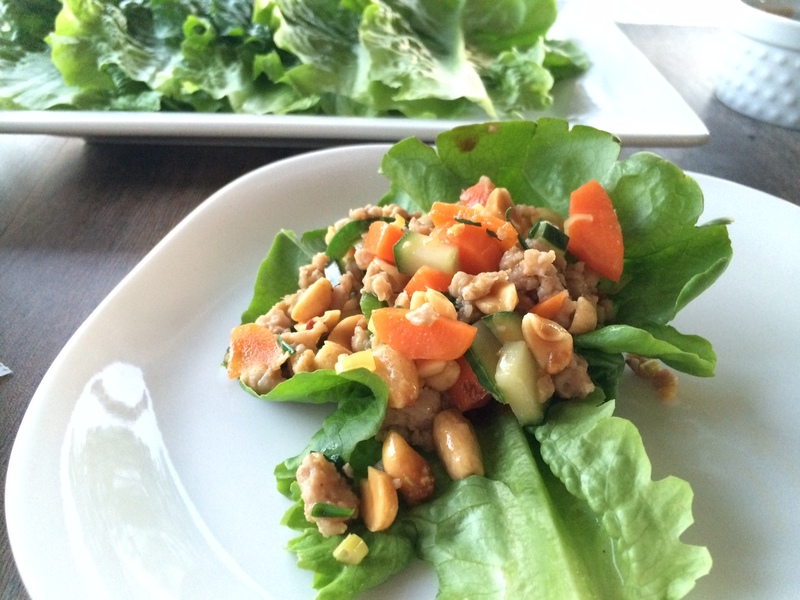 Everyone loves the lettuce wraps from a certain chain restaurant…Many have tried to recreate them, but I think there is no need after finding this recipe. It’s fast, easy, and better than any restaurant wrap! Maybe I am biased because we used beautiful lettuce from our garden. 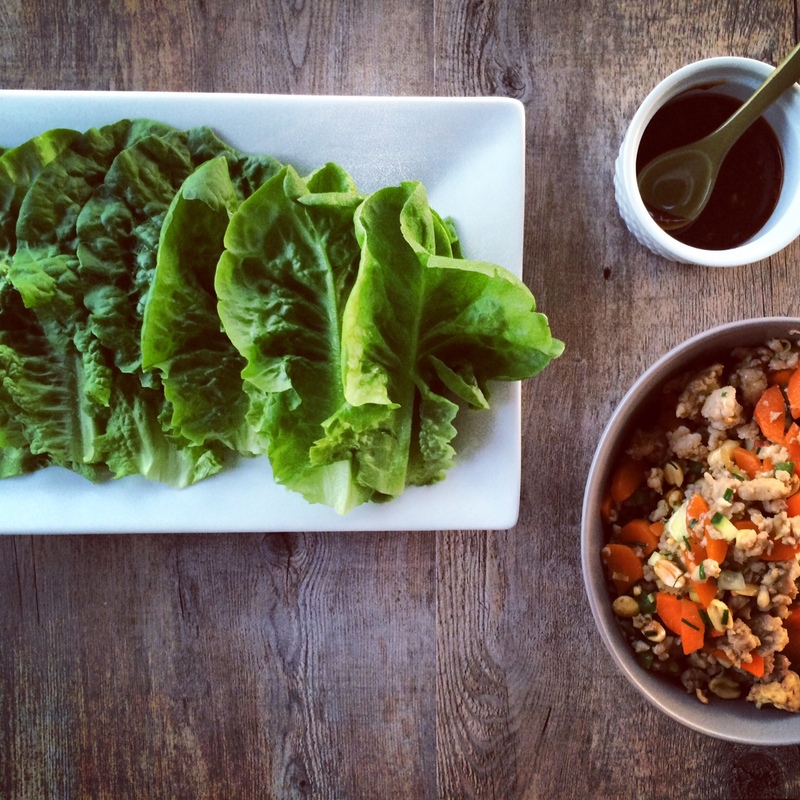 Regardless, what a healthy and fun at-home meal! Mix chicken with 1 tbsp. fish sauce, the sugar, and 2 tbsp. ginger in a small bowl; set aside. In another small bowl, stir hoisin sauce with lime juice, peanut butter, and remaining 1 tsp. fish sauce until smooth; set sauce aside. Heat a large frying pan over medium-high heat. Swirl in oil. Add garlic and remaining 1 tbsp. ginger and cook until fragrant. Add chicken and cook, stirring and breaking up chunks, until no longer pink, 1 1/2 to 2 minutes. Add carrot, lemongrass, and chiles and cook until chicken is cooked through, about 1 minute more. 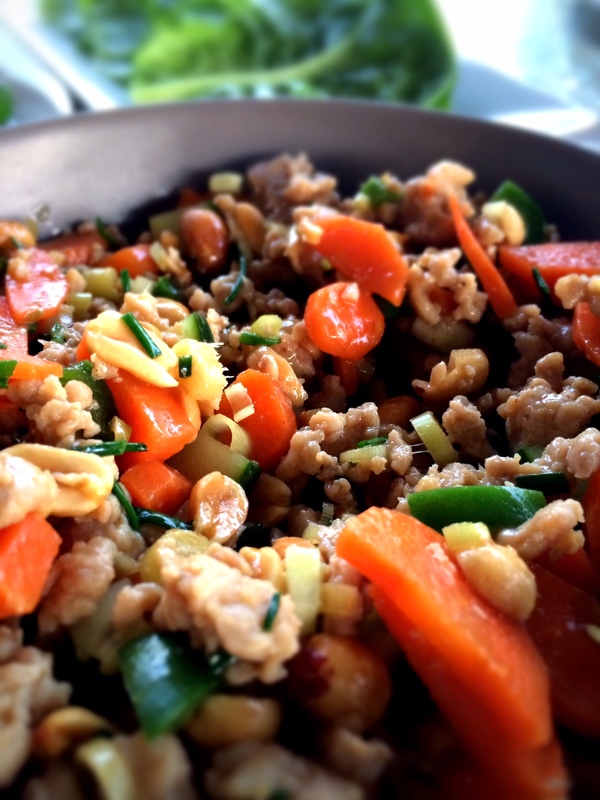 Add cucumber, green onions, and peanuts and stir to combine. Add salt to taste. I added a bit of the hoisin sauce mixture to the chicken to spice it up. Transfer to a serving bowl. 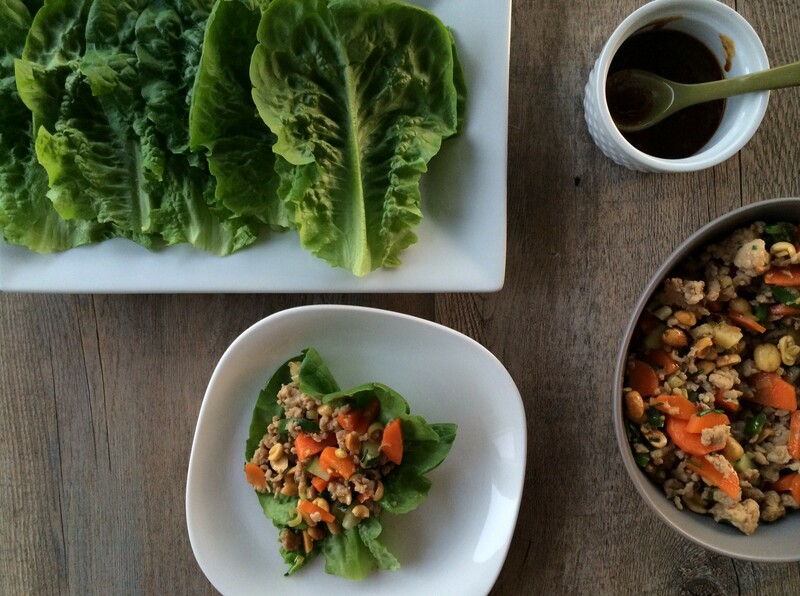 To eat, spread some hoisin sauce on a lettuce cup. Top with chicken mixture, fold up, and eat with your hands. We threw this together on a whim last night for dinner. It came together super easy and quick. It’s super healthy and flavorful. It’s totally portable and I’m probably going to bring it to work for lunch everyday. What more could you ask for, really?!? Cook the quinoa: Rinse the quinoa well. Combine 1 cup quinoa and 1 cup water in a small pot and bring to a boil. Once boiling, reduce heat to low, cover, and cook for about 15 minutes until you can fluff quinoa with a fork. Let cool. Make the dressing: Combine all ingredients in a small bowl except for the olive oil; gradually add oil, stirring well with a whisk. 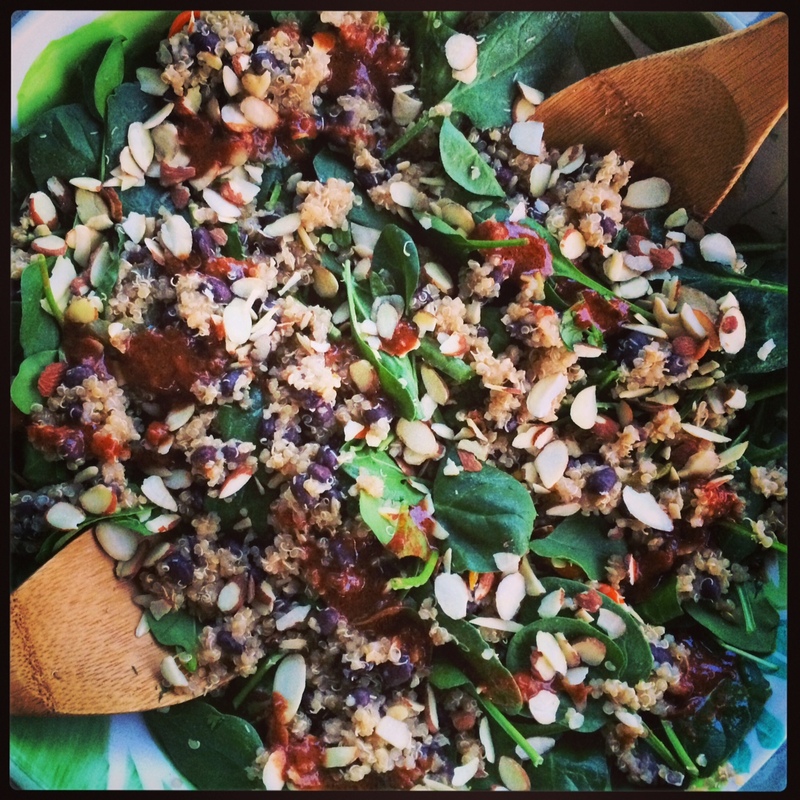 Combine cooled quinoa and all salad ingredients except for the spinach in a large bowl. Add vinaigrette; toss to coat. Add spinach; toss to combine. Oh Hey. Sooo I know Green Tomatoes are kind of a “Summer” thing…But here in the Northwest…I still have tons of Green Tomatoes on my plants. I did get some ripe ones out of my summer…but some didn’t quite mature. But that’s okay…Because!!! 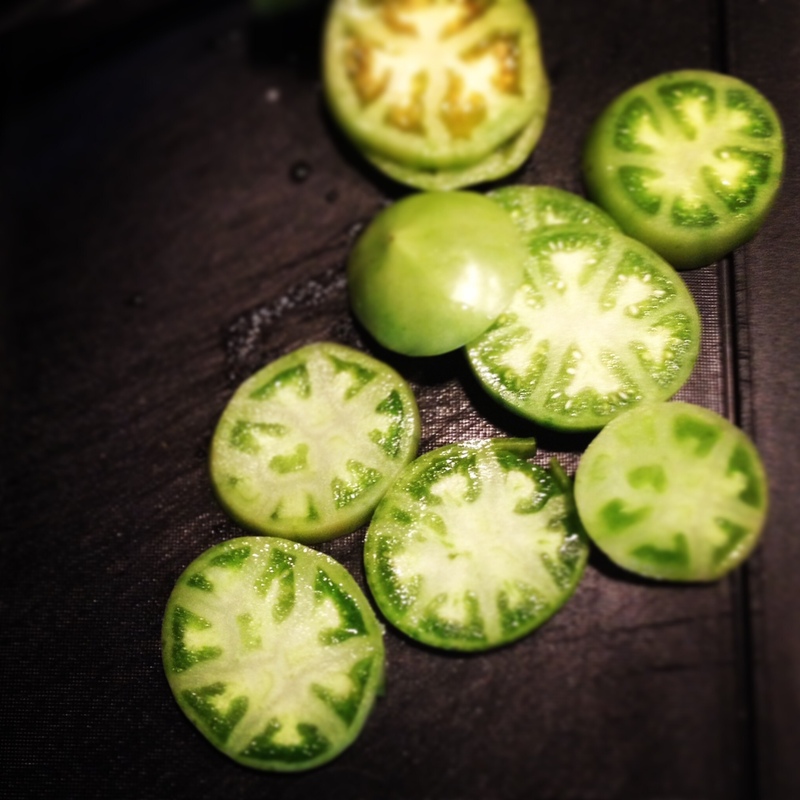 Fun times with Green Tomatoes! 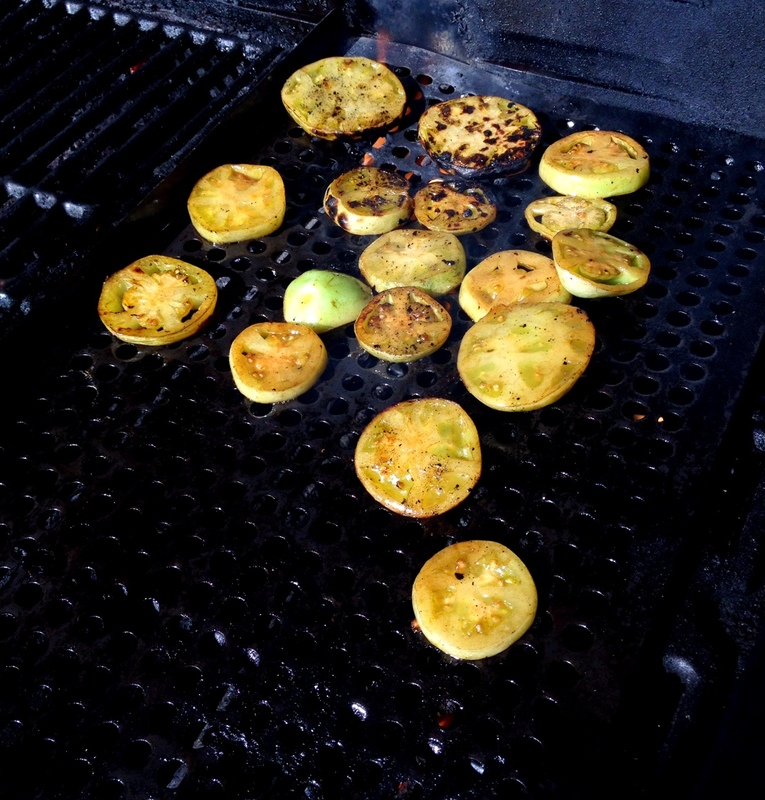 A recipe that is a bit healthier than Fried Green Tomatoes…These Grilled Green Tomatoes made into a Caprese Salad! 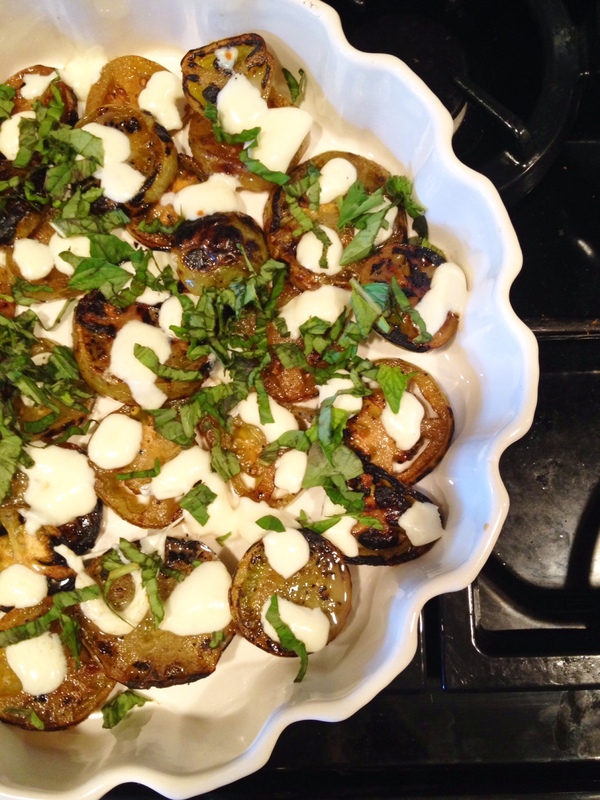 I like this recipe because it is waaay easier than Fried Green Tomatoes. Just marinade them in a little saucy sauce, throw em on the grill…and add mozzarella and basil! We took the extra step to melt the mozz under the broiler, but this recipe is great with fresh cold mozzarella as well! Combine first 5 ingredients in a large bowl or baking dish, stir. Add tomatoes and cover, letting chill for at least 1 hour. Preheat grill to 350° to 400° (medium-high) heat. Remove tomatoes from marinade, reserving marinade. Grill tomatoes, covered with grill lid, 3 to 4 minutes on each side or until tender and grill marks appear. Arrange alternating slices of warm grilled tomatoes and mozzarella cheese on a large, shallow platter. We put our dish under the broiler for a minute to melt the cheese a little bit, it’s great both ways! Drizzle with reserved marinade; season with salt and pepper to taste. Sprinkle with basil. I’m in a zone right now where I’m trying to use up all of the food in the house. 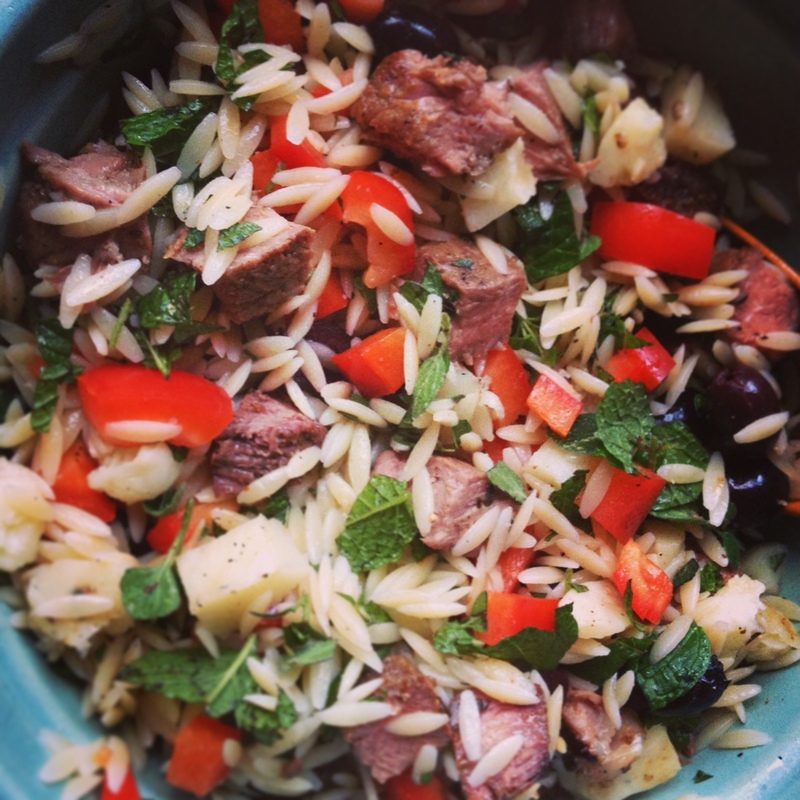 I saw this recipe in Sunset Magazine and thought it would be the perfect use for the large amount of orzo I have laying around. The ingredients don’t seem like anything too fancy, but I was pleasantly surprised with the delicious results. 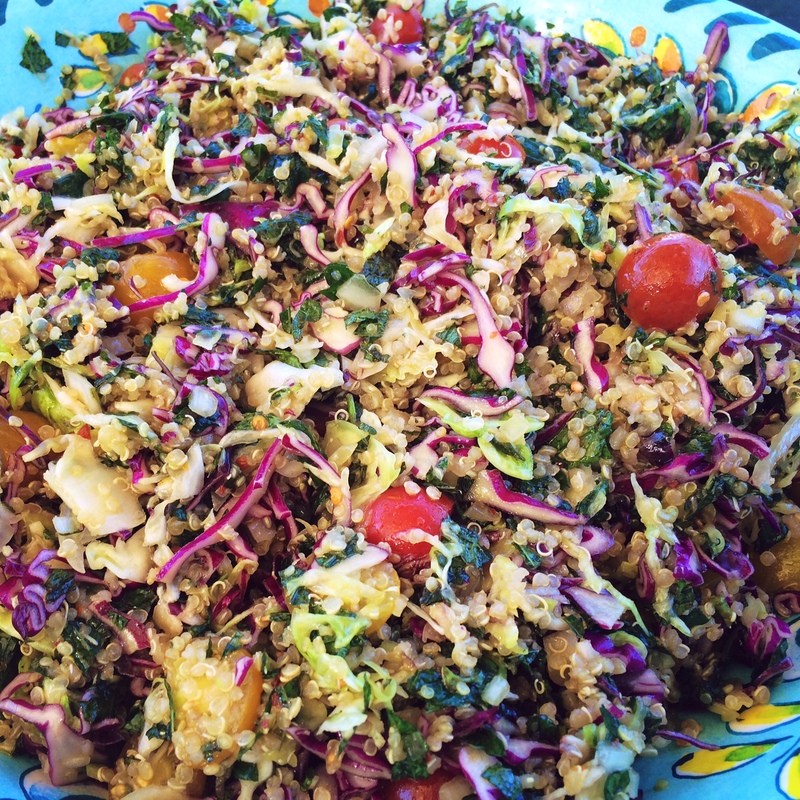 Bonus: this is the best leftover bring-to-work lunch salad ever! Recipe note: I could not find halloumi at my local store, the guy looked at me like I was making sh*t up. I ended up finding Kasseri, which is not the best grilling cheese, but it worked ok. Feta would me a much easier option, just crumbled over the finished salad. 1/2 – 1 whole roughly chopped red bell pepper (depends on how much you like peppers – I went for it and added the whole thing). Heat a grill to medium-high (400° to 450°). Cook orzo according to package directions. Drain, then set aside. Brush steak and cheese with 2 tbsp. oil and sprinkle steak with salt. Grill both, turning once, until grill marks appear on cheese, and steak is done the way you like, 8 to 10 minutes for medium-rare. Let steak rest 10 minutes. Cut halloumi slices into quarters. Combine cheese, orzo, remaining 4 tbsp. oil, and remaining ingredients in a bowl; divide among 4 plates. 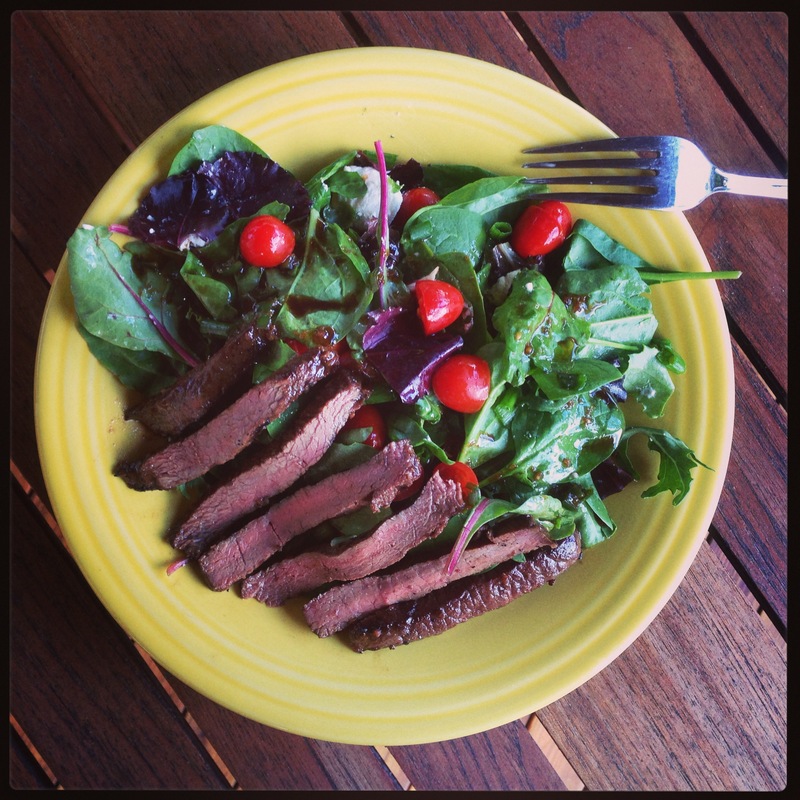 Top with sliced steak. 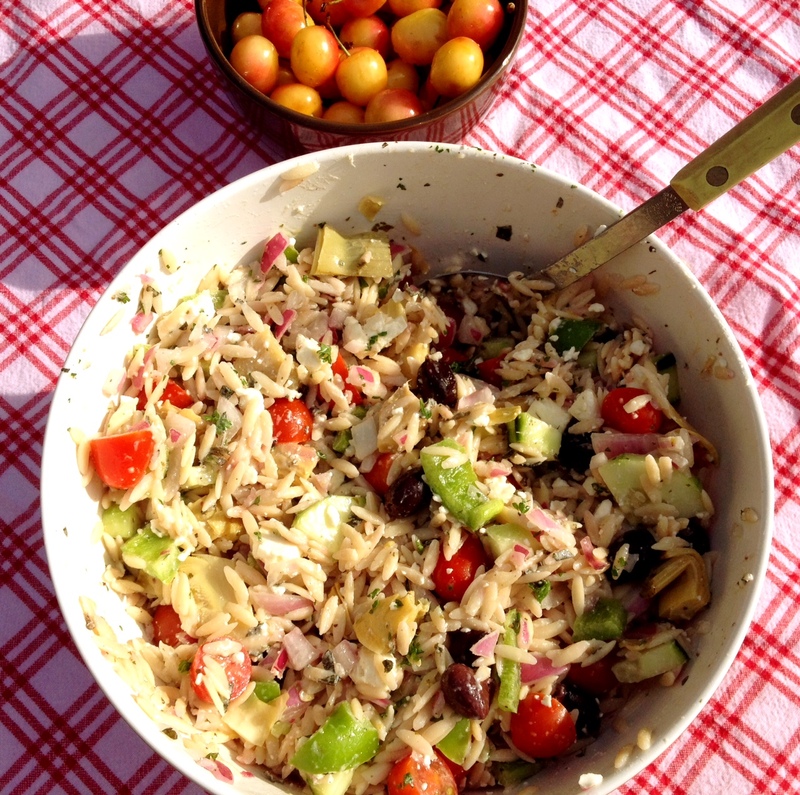 You know Summer is in the Northwest when you see Ranier Cherries…And for me it becomes official when I make this Greek Orzo Salad. This is my, “crap summer is here and my wedding is 70 days away” post. Well, not really…it’s actually more about one of the best summer salads you’ll ever make. 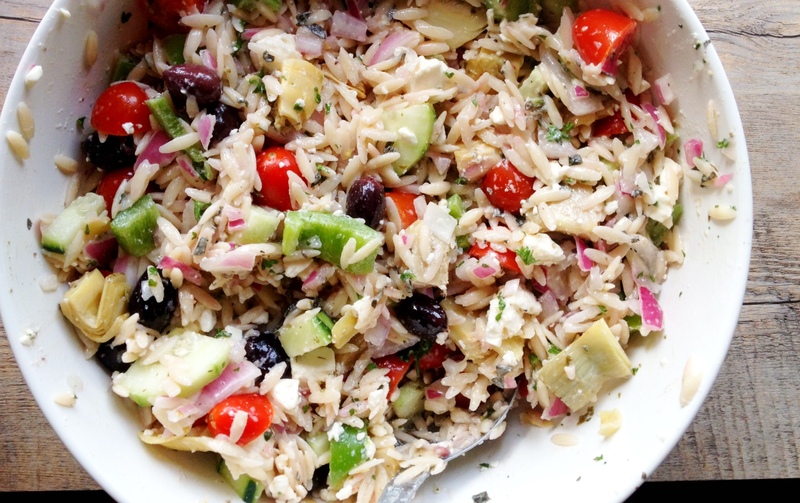 I first made this salad years ago, and I can’t quite remember how I found it, or what even gave me the idea to try to find a Greek Orzo Salad. The only thing you need to know is every time I make it people love it! Plus, it’s relatively guilt-free when you compare it to other mayo-laden pasta salads out there.